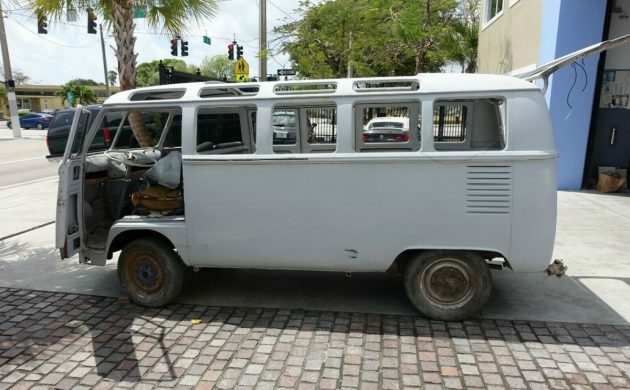 This 1965 Volkswagen Bus is one of the more desirable project vehicles out there right now, as folks still seem to be prone to spending crazy money on 21-window Type 2s. 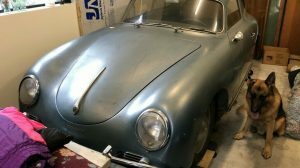 This one was imported to the U.S. from Argentina as a project vehicle that has since had all of its major bodywork completed, according to the seller. Find it here on eBay with bidding over $12K and no reserve. I still see these bringing in very high numbers at auctions, which is surprising as I had the old VWs pegged as a passing fad. Much like my Toyota HiAce project, they aren’t all that pleasant to drive and piloting one on any modern interstate system is an exercise in self-preservation. Factor in the enormously high values – six figures, usually – for a 21-window model like this and it starts to seem as if they’re intended purely as conversation pieces. 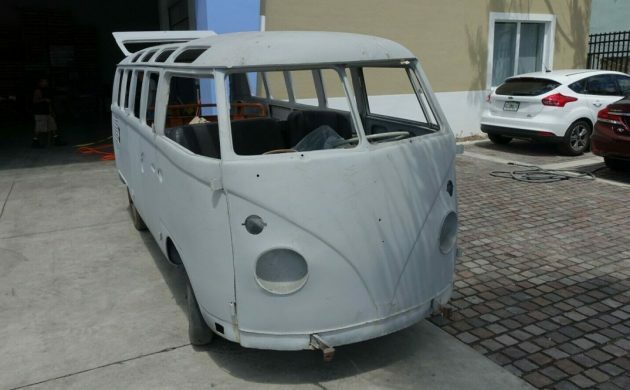 The seller found this Bus in Argentina, where it was originally sold new. The floorpan was rusted out so the body was swapped onto a replacement chassis. The seller has described this Bus as a “what you see is what you get” special, so any parts not visible in the photos are not included. It simply says “most” of the glass is included, so I’d take this to mean you may have to hunt down some of the harder to find pieces. The engine has had it block replaced and upgraded to a 1600 unit. Now, you really have no idea of the quality of the bodywork, so I’d recommend an in-person inspection to assess whether this Bus has the potential to simply be brought back to life from this point, or if you’re going to have to re-do someone else’s work. 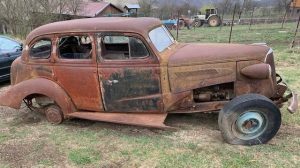 The seller does say that he started the bodywork and has no time to complete it, so I assume that means there is more rust repair waiting to be done. The back benches are some of the more desirable spares in the Bus community, and those are missing as well. There’s a lot of potential here, but more info is needed to know what you’re starting with. I am very much an air-cooled petrolhead, but really see no reason to own one of these. They do not drive well, are too small for a camper, so other than enjoying the restoration process and childhood memories, I’d rather have a vehicle not affected by the wind so much. I guess there is potential here, after seeing one sell yesterday at B-J for around $175K. I believe it was also from South America. I don’t see the thrill, having fixed one up a couple of years ago that was a much more powerful ’78 with fuel injection. I can’t imagine driving one with 20 or 30 less HP. Well, as I have recounted in torturous detail before, I owned a couple of bussess. A ’66 Westphalia and a ’67 21 window. The Westphalia had been crushed at the roof and I bought it to transfer the complete interior into my 21 window , which was for 1983, cherry. Alas, unlike the bidders at this point, $14,400, it has gone past the point where I would spend the money, though undoubtedly some rumpled, gold chain wearing bidder at B-J or elsewhere will bleed gold bars to buy it once it is completed. I’ve owned and driven a couple Bay buses many years back and while I’ll admit 1st and 2nd gen VW buses are CHARMING, I personally think they’re not worth near the premium prices they’re advertized for – regardless of how many windows they may have. I am not sure about the chassis comments, there is no chassis on these. 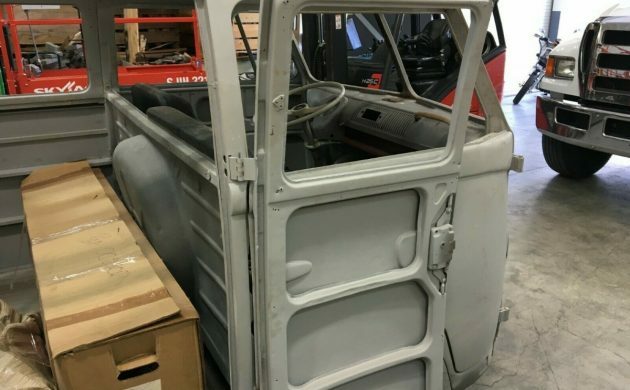 I am in the middle of a full resto-mod of a 1963 panel and you are correct, there is no swapping of a chassis since it is fully integrated into the body. My guess would be they removed the m code plate off a German bus and put it on a Brazilian bus and called it a chassis swap…the Brazilian made buses are significantly different in quality from the German made buses according to the posters at the samba web site. 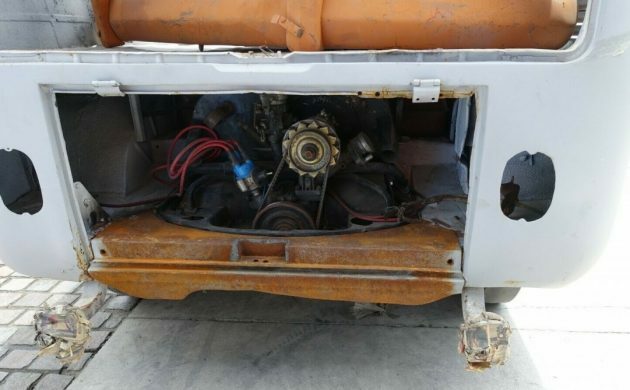 I didn’t really understand what seller meant with a chassis swap – I’d think he must have sectioned the entire floor/lower half off a healthier Bus? Also, any idea whether the Brazilian Buses are IDENTICAL to the German at such vital points, or just ‘similar’? I get it, these are over-priced, under powered and some of them should just be scrapped on the spot. Can we just stop declaring “I don’t get it” or “who would pay for this junk?” The market has decided the value. We just have to accept it and move on. For what these grab I’m surprised they’re not re-popped . Dynacorn could make 10 times the cash repopping these than the Mustangs and Camaros. And it might bring the prices on original ones back to reality. Apparently, this is all that’s left in the world, and you’ll have to go halfway around the globe to get it. Someone did. Pretty crazy, these things go for this kind of money, we go through this everytime. Clearly a fad, as it’s not because these are such beautiful vehicles. Fact is, if you’ve ever driven one, like me I’m sure you’re shaking your head whenever these come up. We’re the numbskulls for not saving at least one. Could have paid the bills, but who knew? This is not a 21 window VW, it’s a 19 window VW. The 21 window version has windows at the corners of the rear of the vehicle. I don’t know a lot about these busses because I never cared much for them, this one is a 21 window, I think I saw a 23 window VW sell on BJ for over 100k still ugly but totally fixed up ugly! To the folks who are into these this looks like a decent project! 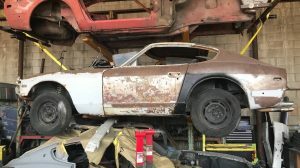 Here is the saga of one that sold at Mecum for cubic dollars and resulted in arrests and a settlement. Most auction busses are garbage and a nicer one can be found online for less money. Bill, count with me. Windshield (2), driver’s and passenger’s door (2), rear hatch (1), each side of car has (4) main square windows and 4 skylight oval glass sections x 2. Adds to 21. A few early buses had the wrap around glass in the tail section on both sides, which would then add to 23 total. I have only seen that feature on rag top buses, and it was already discontinued prior to this featured barn bus. It is my belief that these wrap around “glass” pieces were not actually glass,because of their unusual shape. Some early form of plastic is my understanding. Once again, these pieces are truly rare and almost never found at any price. I have two buses a 71 and 84 westy. Yes they are slow af and handle like crap. I would never spend 100 plus grand on one. I have less than 10 grand in both of mine. I live on Maui so we have no highways and I love camping in my westy. I smile everytime I drive em. There’s nothing I hate more than a full paint job, jambs and all, of poor quality. They shot every surface of this poor thing with gray primer and then let it rust. Sad. You’re at square one! Remove all the primer and body work and start over. I had a ‘66 double door ambulance Bay Window then a ‘74 2.0 Bus. 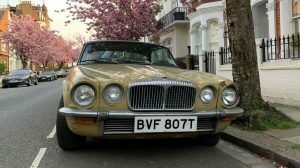 The ‘74 was a vast improvement over the ‘66 in handling, braking and acceleration (as long as I stayed away from cross winds on interstates in New Mexico). When I backed over a beach ball sized boulder in the dark and lifted three cylinders off of the block I got estimates for a rebuilt short block. That made me think about using it for a chicken coop but I found a VW to Ford 2.0 four cylinder conversion kit from Esslinger Engineering and installed it and a honking big Dodge truck radiator and two Audi 100 LS fans and it scooted nicely.. and I had a heater core and 28’ of heater hose for max heat. Since then I’ve done two Subaru turbo implants in mid seventies Buses with great results.. In a Bay Window I’d just stuff a cheaper used 1600 dual port in it and call it a day. A Bay Window Bus doesn’t have any business going over 55-60 mph with stock suspension and brakes..
Then there’s the stupid costs up front for any Bay Window..
Glass all there? Those upper 8 Sekurit pieces are very pricey. As for the rest of the restoration necessities, better keep the wallet open. Before placing $1 towards purchase of an item such as this, know the “how to” to verify that you are getting exactly what it is being represented as being! Ignorance will not save those that fail to do the necessary homework. Facsimiles exist.